JEFFERSON CITY, Mo. 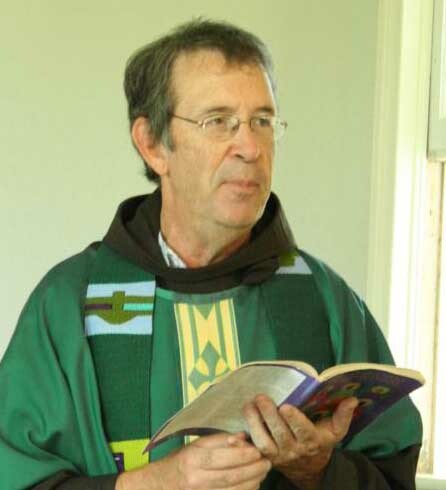 (CNS) — For his silver jubilee as a priest almost a decade ago, Franciscan Father Ed Mundwiller prayed for God to keep calling him beyond the boundaries of his own comfort zone, into places he never thought he would go. “The old ‘normal’ and the old certainties go away, and God fills in the void with a call to justice and decency,” he said in a 2007 interview with The Catholic Missourian, newspaper of the Diocese of Jefferson City in central Missouri. Father Mundwiller, who goes by “Friar Ed,” believes that is exactly what happened while he was walking in his St. Louis neighborhood the afternoon of Feb. 2. He spoke briefly with a teenager and gave him a dollar. The teen followed him into an alley and attacked him, pummeling his face and breaking his leg while trying to get his billfold. Friar Ed was taken to a nearby hospital, where he was treated and released pending surgery to mend a fractured bone. His doctor said he’ll probably need “a little hardware” in his knee and won’t be able to put weight on it for about three months. Friar Ed, a native of Gasconade County in the Jefferson City Diocese, said this was the only time anything like this has happened to him in the 15 years he’s been part of the Franciscan community at St. Anthony of Padua Friary in South St. Louis. “As a repentant, I don’t think I’m better than anyone else,” he added. Family and friends have been sending him gifts and more cards than he’s been able to open all at once. Some friends at St. Augustine Parish in North St. Louis, where Friar Ed occasionally fills in for Mass, sent him some snacks and beverages in time for the Super Bowl. In this situation, “he’d probably be out looking for that guy to get him to join his merry band of outlaws!” said Friar Ed. The priest asserted that there are criminals in low places and criminals in high places — the ones who perpetuate inequitable conditions, keeping people in low places from moving up. “The ones in high places — they’re the ones Friar Tuck would be worried about,” he said. Since word got out about the incident in the alley, Friar Ed’s mailbox and voicemail have been overflowing with warm wishes and promises of prayer. “The prayers seem to be doing a lot of good for me,” he said. “But there are a lot of people in this neighborhood and all around the world who also need prayers. “Maybe we can shift some of our prayers toward them,” he said. Friar Ed grew up near Hermann. Franciscan priests and sisters and the entire community at St. George Parish and School in Hermann helped him discover his priestly calling and affinity for people on the margins of society. For a time, he attended boarding school at the old Augustinian Academy in St. Louis, a short distance from where he now lives. Back then, the neighborhood was vibrant, full of young people and unabashedly Catholic. It’s still full of young people, many of whom don’t have access to the same advantages Friar Ed had. “I feel like there’s a Grand Canyon — maybe even a whole solar system — between the neighborhood I once knew and the one my young assailant lives in,” he told The Catholic Missourian. Friar Ed is cooperating with his neighbors to try to restore some of the networks that helped people of his generation land securely in adulthood. “At least, that’s the dream,” he said. Known for his storytelling and for creating artwork that challenges social injustice, Friar Ed volunteers at two local public schools. The students belong mostly to low-income families and racial or ethnic minorities. Friar Ed and some friends helped start a chess team at one of the schools, and he assists with an after-school program that helps grade school students develop leadership skills. That’s what he was walking home from when he encountered his assailant. The key, he said, is to see past their difficulties and hardships and love them for who they are. That’s what he wants people to do for the young man who hurt him. “Please pray for him and everyone like him, the ones who for whatever reason fall through the cracks of our ministries and wind up feeling hopeless and invisible, those who need to have God’s mercy shown to them,” he said. Nies is editor of The Catholic Missourian, newspaper of the Diocese of Jefferson City.